We get it: You’re busy during the holidays. In between shopping for the perfect holiday gifts, finding a dress with just the right amount of sparkle, and figuring out a dish that your paleo/vegan/Whole30 family and friends can all eat, styling your hair falls to the bottom of the list. You can still look your most festive self without spending an hour armed with hot tools and brushes. Heed the advice of celebrity hairstylist Kristin Ess and use accessories to your advantage to create quick and easy holiday hairstyles. Ahead, you’ll find five simple hairstyles that will take anywhere from five to 10 minutes to look party-ready. 1. Find a wide scarf in the print of your choice. It’s best to use a bigger piece of fabric to help fatten the braid that will eventually turn into a bun. 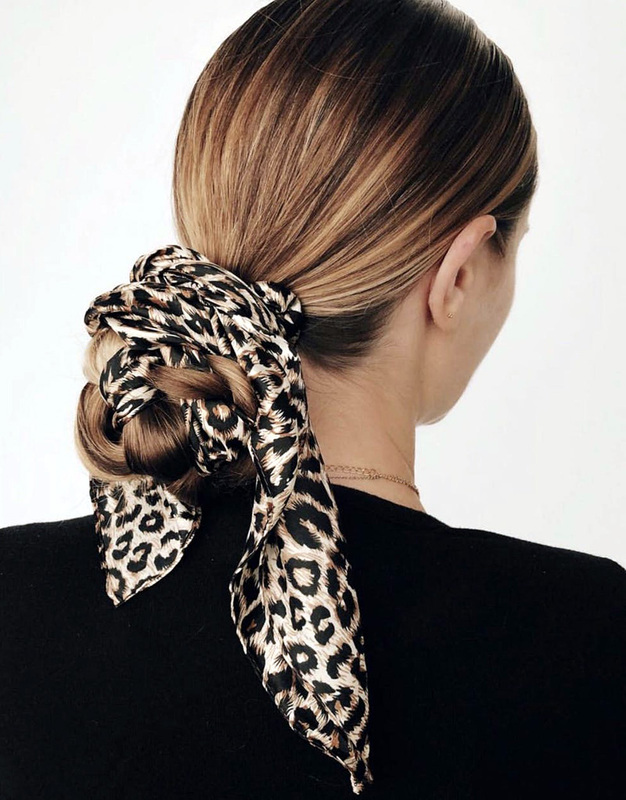 “This style works best on longer hair so that you have enough hair-to-scarf ratio; however, if you have shorter lengths, you can use a thinner scarf to achieve the look,” Ess, who works with Lauren Conrad, Jenna Dewan, and Lucy Hale, says. 2. Secure your hair into a low ponytail using a clear elastic hair tie. Apply a smoothing balm (like the Kristin Ess Anytime Anywhere Recovery Balm ($14)) from your hairline down to your pony to add shine and keep flyaways at bay. 3. Use one hand to stretch your hair tie so that your other hand can loop the scarf through the hole. Fold it in half so you have two pieces of scarf dangling in with your hair. 4. Split your ponytail into two sections, and use both pieces of the scarf as the third section. Braid the scarf with the two sections of hair to weave a traditional three-strand plait down the lengths of your hair; stop three to four inches from the bottom and tie it off with a clear elastic. 5. Gently pancake (read: pull apart) your braid to help make it more voluminous. Twist it into a bun, using the remaining ends of the scarf to wrap around the base of the low knot style. Pin it in place anywhere the style feels a bit loose. From there, play with it until it looks exactly how you’d like. 1. Secure a ponytail right below the occipital bone on the back of your head using a clear elastic hair tie. 2. Twist your pony up and around as if you’re going to put it in a bun. After one twist, pin the half bun (leaving your ends free) in place. Make sure all bobby pins are concealed. 3. Insert decorative bobby pins along one side of the bun. 4. Finish by scrunching the ends of your hair with wave spray (like the Kristin Ess Soft Shine Beach Wave Spray ($14)) for semi-shiny texture and separation. 1. 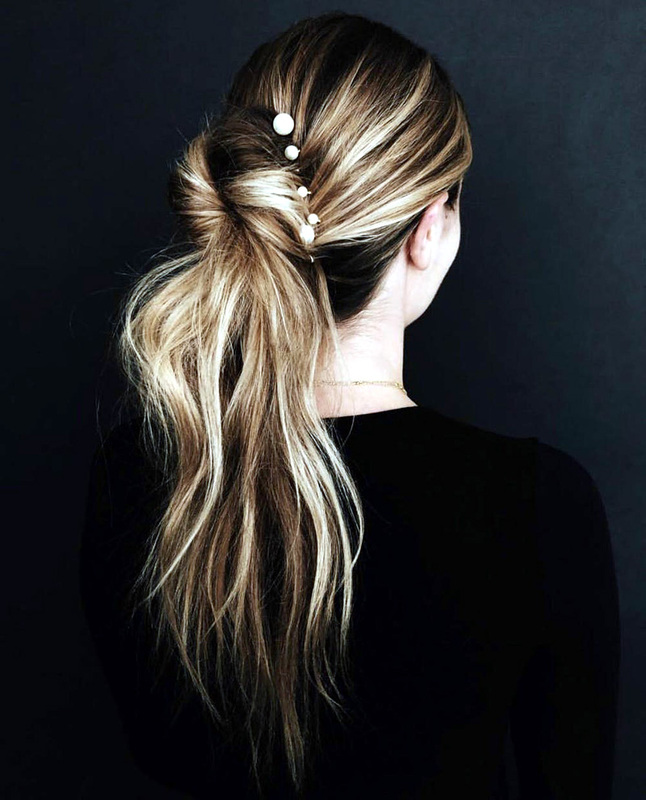 Bend forward and secure all of your hair in a high ponytail using a clear elastic hair tie. “Flipping your head will help create a smoother finish from your hairline back to your bun, and it will help your ponytail stay tight atop your crown,” Ess says. 2. Use styling powder (like the Kristin Ess Working Texture Loose Styling Powder ($10)) to help fluff up the ponytail. “You’ll never be able to achieve a jumbo bun with straight, clean hair, so loading it up with powder will help give it the added texture and grip it needs,” Ess explains. 3. Twist your now-voluminous ponytail into a bun and pin it in place. Lightly pull apart the bun for a bigger, slightly undone vibe. 4. Wrap a silk ribbon around the base of your bun, tying it into a large bow on the underside. If you prefer using a hair accessory that won’t untie, take a note from Kate Middleton and clip in a black velvet bow barrette to achieve the same look. 5. Lock in place with hairspray. 1. Start by spritzing your hair with a thickening, heat-protecting spray (like the Kristin Ess Instant Lift Thickening Spray before curling your hair with a 1.25-inch curling iron. 2. Give your strands some grip using texture spray (like the Kristin Ess Dry Finish Working Texture Spray before shaking your curls out. 3. 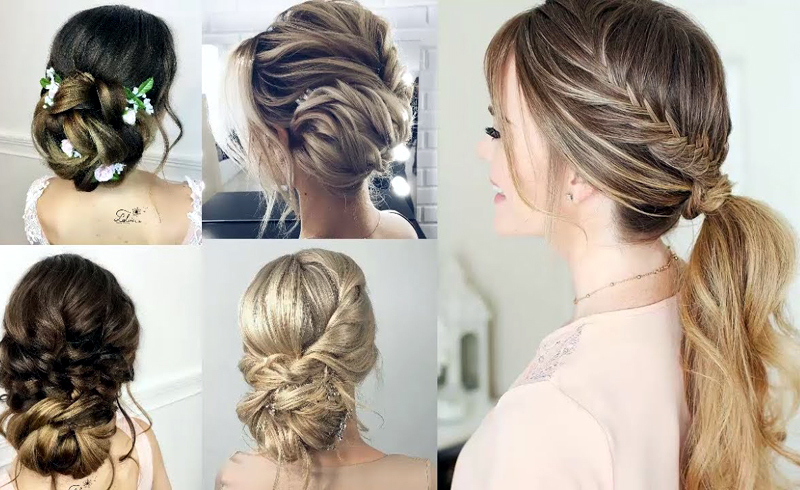 French braid your hair from the crown down to the nape of your neck, tuck the tail of your braid under, and pin it in place to create a tucked updo. Pull apart your plait (as well as the overall hairstyle) so that it looks a bit more effortless. “If you have shorter hair, you may find that pieces around the front of your face won’t stay inserted in the braid. For these pieces, pin them in place along the spine of the braid, and don’t worry about face-framing ones that don’t reach,” Ess says. 4. Stagger three bobby pins along the hairline on one side of your face. 5. Finish with hairspray so that your seemingly undone style doesn’t actually fall out. 1. Wrap small sections of hair around the barrel of a curling iron, switching directions as you go. “Wrap to the right for the first half of the section and then switch to the left for the bottom half,” Ess says, noting that this technique gives more of a natural appearance to your waves. 2. 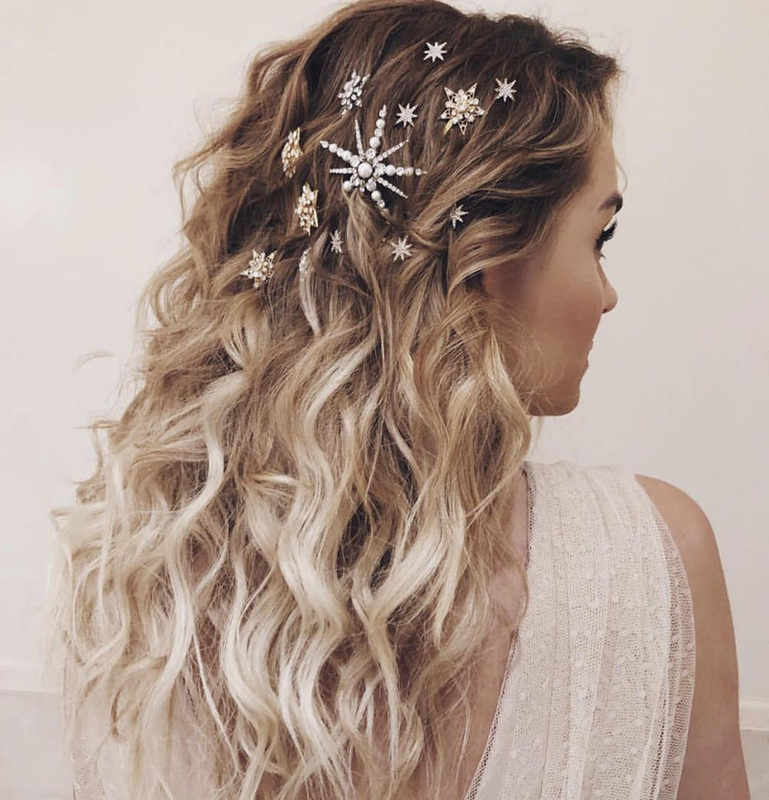 Using two mirrors (one to look straight forward in and one to see the back of your head), arrange a constellation of sparkly bobby pins throughout your waves. “There’s no rhyme or reason to how this should be organized; simply pin a few strands together at a time until your [Starry Night masterpiece] looks complete,” Ess says. 3. Finish with hairspray to lock your look in place.